At Best Nest Wellness, we believe in your power to change the world by the choices you make. You need a prenatal formula to support your superhero status! 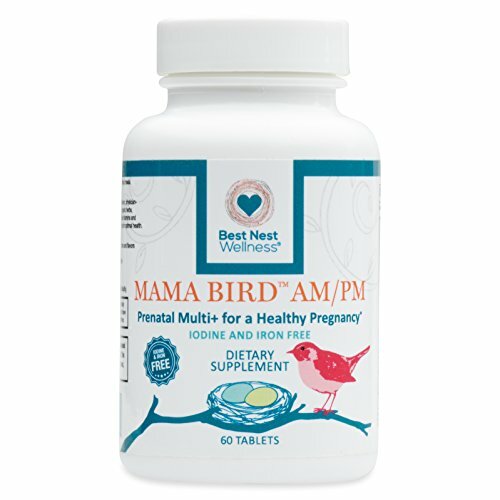 Created by experts in Neuro-Nutrition, Mama Bird AM/PM Prenatal Multivitamin Iron + Iodine Free is the most advanced multivitamin of its kind. It is perfect for prenatal, pregnancy, IVF, postnatal and breastfeeding mothers. – METHYLFOLATE, a natural, more absorbable form of folic acid, for optimal neurological development. – METHYLCOBALAMIN is the most potent form of B12 found in nature..
– VEGAN. Our vitamin D comes from lichen, a plant source. – PROBIOTICS & ENZYMES to enhance digestion and absorption. – Free of artificial colors and flavors, sugar, sweeteners, preservatives, gluten, soy, yeast, fish/shellfish, nuts, GMOs, and dairy/lactose.